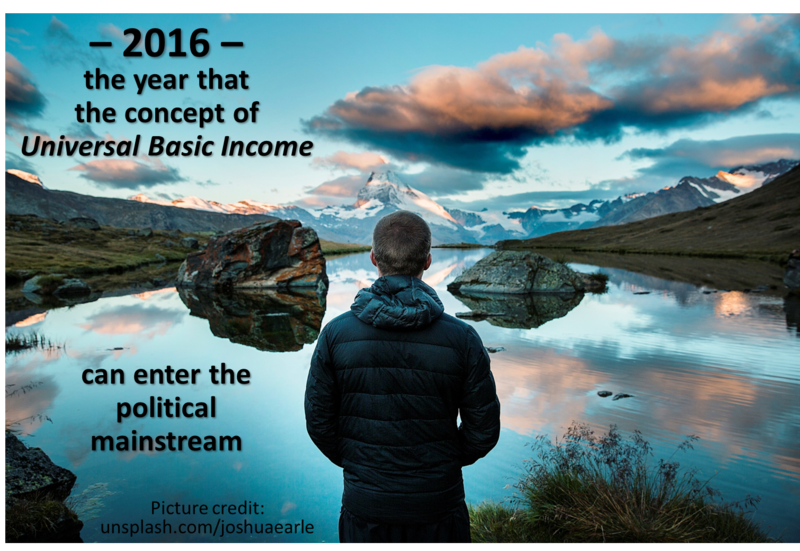 2016 is the year that the concept of Universal Basic Income can enter the political mainstream. It removes the “big brother is watching you” surveillance that treats all recipients of community payments as being suspect of cheating or shirking. Transformational ideas such as UBI take time to mature – sometimes a long time. But 2015 saw plenty of evidence of progress in the public discussion about UBI. Key open questions are rising to the fore – questions that Transpolitica will be helping to highlight and suggest answers. At the end of 2015, Transpolitica consultants worked with members of the Transhumanist Party (UK) to prepare a press release about UBI. An extended version of that press release can be read below. The press release was prompted by the publication in London by the RSA of a comprehensive report released on the subject of UBI. The Transhumanist Party today welcomed the publication of the RSA’s report “Creative citizen, creative state: the principled and pragmatic case for a Universal Basic Income”. All citizens shall have a right to sustenance, clothing, shelter, energy, healthcare, transport, education, and access to information resources. The Party also advocates that all citizens must be able to contribute to society, in their own fashion, without blemish to their dignity or sense of self worth. According to Transhumanist Party research and analysis, accelerating technological unemployment has the potential – within the next decade – to magnify social inequality, disruption and alienation. People who trained hard for new career opportunities may discover that their employment prospects have been overtaken by increasingly sophisticated robots, AIs, software, or other automation. A new social contract is needed, involving strong educational and economic support for those who are left with no viable option of ‘earning a living’ due to rapid technological change. A UBI would provide an important part of this new social contract. The RSA’s advocacy of a UBI will help the task of the Transhumanist Party to bring about new political thinking in the UK that champions individual and social creativity. Mandating that, where possible, overseas foreign aid should be made available to local citizens via direct UBI schemes rather than by government manipulation. The following comments provide further analysis, as replies to frequently asked questions. Q1: Will a UBI remove people’s motivation to contribute positively to society? Different writers express different intuitions on this question. This is an example where the Transhumanist Party principle of evidence-based policy should be applied, to adjudicate between these different opinions. There is evidence from Basic Income pilots in the less-developed world that it spurs entrepreneurship. In developed world pilots, it has been shown to enhance wellbeing through better education and health and these are important foundations for greater creativity. This remains a hypothesis but with enough evidence to warrant further testing. That is why we advocate a Basic Income pilot on the lines proposed in Netherlands, Finland and Canada. This would involve a whole city or city-region adopting a Basic Income to analyse its impacts over a reasonable period of, say, five years. If the results were positive then it could be rolled out before the five years is up. Q2: How can the UK afford all the payments comprising a UBI? In the medium timescales (several decades), the abundance of goods created by powerful new automation and exponential technology will be more than enough to meet the basic aspirations of every citizen. However, there remains the question of how to transition from the present economic situation to that future sustainable abundance. The system proposed by the RSA for shorter timescales is essentially tax-neutral: the amount of taxes already collected by the government, redistributed, will basically cover the costs of all proposed payouts. This is because the initial UBI is set at minimal levels, such as £71 per week per adult. Because the scheme is tax-neutral, it is more politically tractable. As a result of UBI, more people will in due course find work that is personally pleasing and satisfying to them, without having to rush to accept the first available employment. In turn, due to increased work satisfaction, the productivity of the entire economy should rise (in both the voluntary and the paid sectors), allowing society to afford higher rates of UBI payment. In parallel, there is scope to explore alternative ideas to distribute as “citizens’ dividends” the overall wealth of the nation – wealth derived from national assets such as 5G wireless spectrum auctions, land usage, greenhouse gas emission, and so on. These ideas are explored in books such as “With Liberty and Dividends for All: How to Save Our Middle Class When Jobs Don’t Pay Enough” by Peter Barnes, and “The Public Wealth of Nations: How Management of Public Assets Can Boost or Bust Economic Growth” by Dag Detter and Stefan Fölster. The combination of citizens’ dividends and the initial UBI can be expected to grow in total over time, eventually resulting in a UAI (Universal Abundant Income) rather than a UBI (Universal Basic Income). This entry was posted in Preview and tagged 2016, The RSA, Transhumanist Party, Transpolitica, UBI, Universal Basic Income by David Wood. Bookmark the permalink. “there remains the question of how to transition from the present economic situation to that future sustainable abundance” – and this is the salient point. In my view the mentioned “technological unemployment”, namely automation or robotisation, is leading to rapidly increasing productivity as well as expense (on labour) reduction; the enormous profit potential thus generated is currently pocketed by the plutocracy, which will not be willing to give up this windfall without a fight. £71 per week is a cute start, but given the fact that 15 years ago i paid £275 for my 1.5 bedroom apartment in Earls Court, it seems clear that it is only a start. The real money will have to be wrested from the obscene profits of those whom the current economic systems favour. I agree that the concept of PQE (people’s quantitative easing) deserves further study. Something similar was discussed in the London Futurists event addressed by Professor Andrew Keen, “Will we crash again” – there’s a video recording of Professor Keen’s presentation at https://www.youtube.com/watch?v=HpfLiKRqhQw, and an audio recording that covers the audience Q&A too at https://soundcloud.com/conwayhall/london-thinks-will-we-crash. London Futurists plans to return to these topics with events to be scheduled during 2016.